Pro hockey arrived in Flint in the summer of 1969, when the IHL granted an expansion franchise to Frank Gallagher. The team would play in the new IMA Sports Arena, a 4021-seat arena on Lapeer Road in Flint. The team would be called "Flint Generals", a nod to the city's close relationship with General Motors, which had several plants in the city at the time. 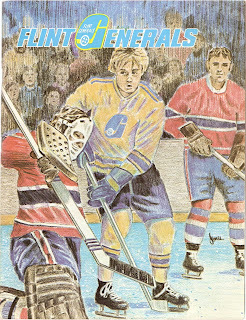 The Generals were very popular in the Flint area, and lasted for 16 seasons (1969-85). The Generals only missed the playoffs one time, their inaugural season, in their entire existence, including their four-year stay in Saginaw. Here are some of their programs. As you can tell, some of them are pretty artistic. 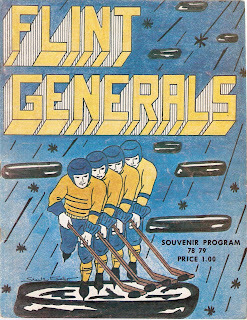 The Generals had a strong season in 1974-75, going 44-26-5, good enough for second place in the North Division, six points behind league-leading Muskegon. The Gens were lead by Doug Manchak's 61 goals and Kirk Bowman's 108 points. With Merlin Jenner and Bob Volpe in net, the Gens surrendered the fewest goals in the IHL that season (220). Another player of note was tough guy Frank Beaton, whose nickname told you how good he was in fights: "Seldom". Future Maple Leafs coach Doug Carpenter was behind the bench. After a great season, the Generals were upset in Round 1 by the Saginaw Gears. Flint was outscored 22-10 in the five game series, including being shutout in the last two games of the series. Very nice drawing on the front of the program. As far as I know, this design was on all the programs from that year. 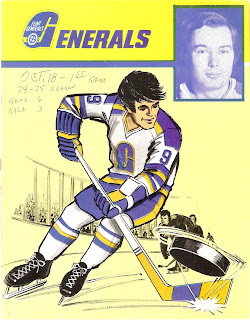 A different Generals player was featured each time. I think the Gens player on this cover is goalie Merlin Jenner. The Generals slipped to 35-33-10 in 1976-77, good enough for third place in the North, 11 points behind first place Saginaw. The Gens scored the most goals in the league that year, with 342. The offense was led by Jim Koleff (52 goals, 114 pts. ), Mike Clarke (43 goals, 108 pts.) and Ted Bulley (46 goals, 92 points). Rick St. Croix and Bob Volpe were the netminders for the team that year. Carpenter was again behind the bench. Once again, the Generals were quickly bounced out of the Turner Cup Playoffs. This time, the Kalamazoo Wings eliminated Flint in a five-game series, outscoring the Generals 30-14 in the process. 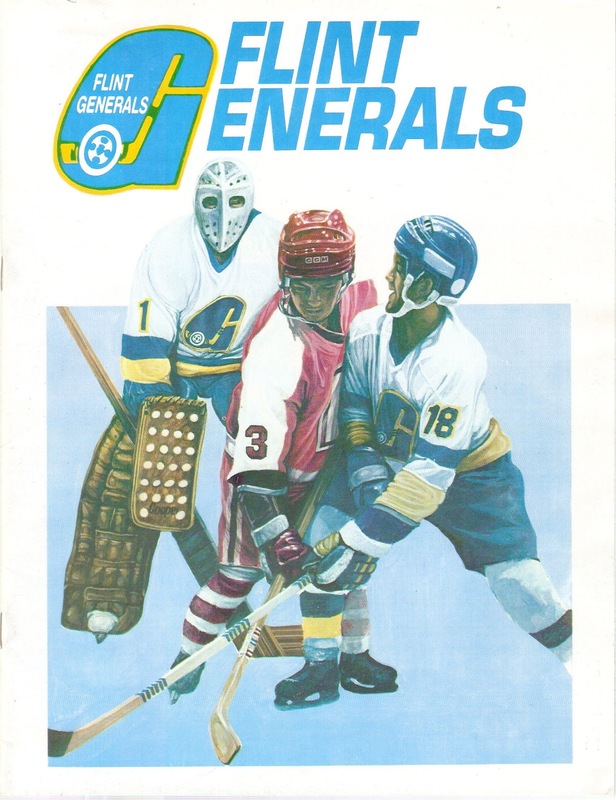 Of the Generals programs I have, this one is probably my favorite. Very nice drawing on the front. Recognize the goalie? Kinda looks like Ken Dryden of Montreal. And yes, the Generals did wear yellow jerseys at home back then. It was the 1970s after all. 1977-78 had a similar finish as the previous year: another third place finish, this time with a 36-34-10 record, twelve points behind first place (and defending champion) Saginaw. Doug Carpenter's squad had no problem putting the puck in the net, as they scored 364 goals, tops in the league. The offense was led by Jim Johnston, who scored 41 goals and 118 points. Rick Cabalka (43 goals), Terry Smith (35) and Mike Clarke also helped make the Generals a dangerous team on offense. Defense, however, was the team's big shortcoming. 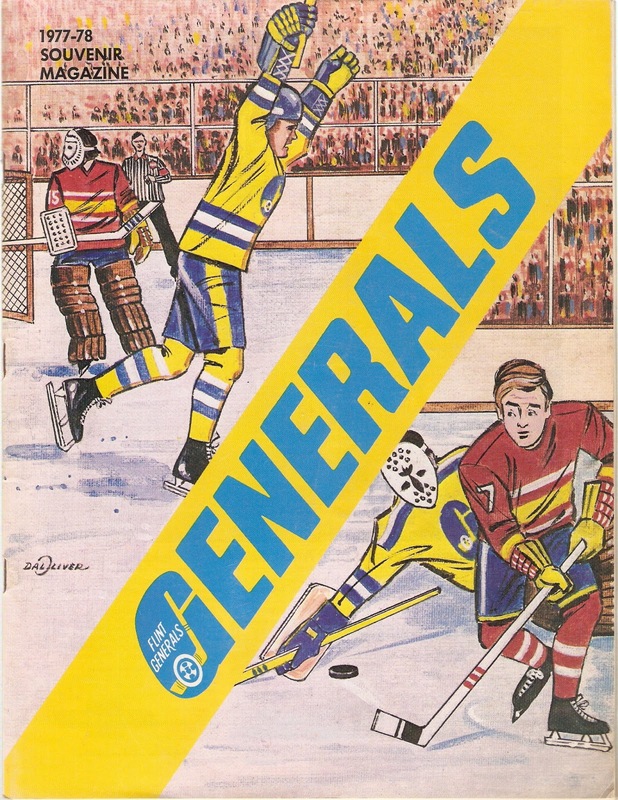 The Generals allowed a league-worst 381 goals. Rick Szabo and Randy Ireland played the majority of the games in net for Doug Carpenter's final Generals team. Once again, the Generals were quickly knocked out of the playoffs. This time, the Kalamazoo Wings finished them off, in a five game, low scoring affair. Another slick design for this program cover. Not as nicely drawn as the previous year's cover, but still pretty sharp. And again...the yellow jerseys. 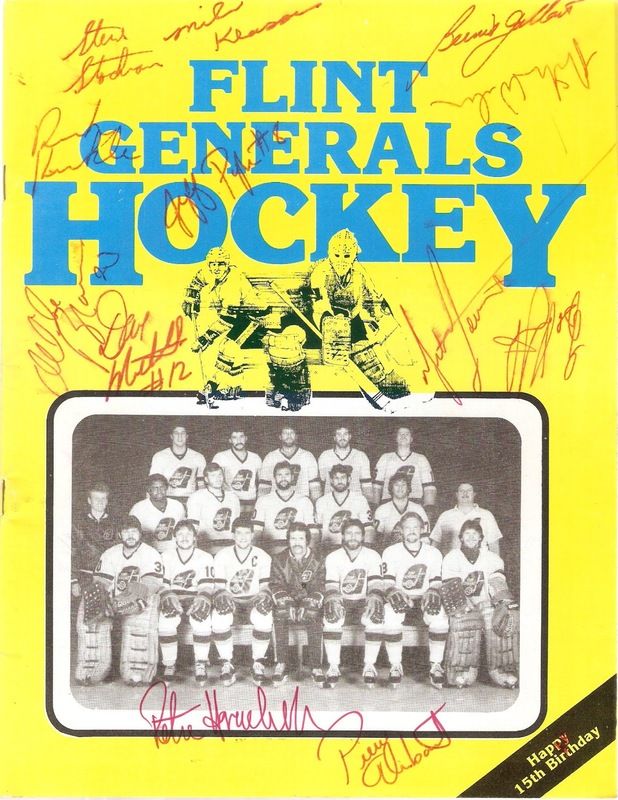 In 1978-79, the Generals dropped to fourth place, with a 35-40-5 record, 20 points behind first place Port Huron. Despite having four players with 30+ goals, the Generals faltered with a weak defense, as all their goaltenders had GAA's over 4.00. Marc Boileau, who coached the WHA's Quebec Nordiques the previous two years, was behind the bench for the Generals. The Gens upset the Port Huron Flags in Round One in seven games, a rare series victory. In Round Two, the Generals were smoked in four straight by the eventual Turner Cup Champion Kalamazoo Wings, being outscored 23-11. Kind of a crude drawing on this program, especially when you compare it to the previous programs I posted. In 1982, the Generals brought in Ted Garvin as Head Coach and General Manager. Garvin was a very successful coach in the IHL, having won four Turner Cups in seven attempts in Port Huron and Toledo. Unfortunately for Flint fans, Garvin didn't have the same success with the Generals. His first Gens squad finished in 6th place, with a miserable 32-45-5 record, 37 points behind first place Toledo. 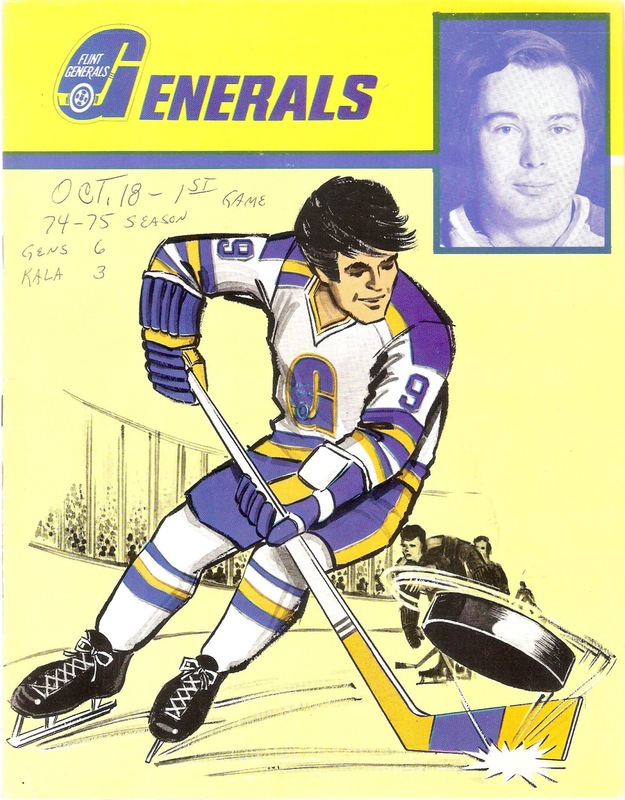 Garvin's second season with the Generals was an improvement, as the Generals finished third in the new East Division, with a 35-36-11 mark, 32 points behind first place (and defending champion) Toledo. Tony Fiore led the Generals attack, scoring 66 goals and 114 points. Future Montreal Canadien Steve Penney and long-time minor leaguer Rick Knickle were between the pipes. Flint made the playoffs for the thirteenth straight year, an impressive streak for any minor league franchise. However, they were knocked out by Fort Wayne in five games in a best-of-five series. 1983-84 was the Generals greatest season. This was a franchise that, while a perennial playoff team, was never able to bring home a championship for it's loyal fans beforehand. More often than not, the Gens were knocked out in the first round, often in four or five games. Ted Garvin stepped down after two seasons and was replaced by rookie head coach Dennis Desrosiers. Desrosiers retired from playing after the 1979-80 season in Saginaw, but made a two-season comeback with the Generals two years later. Over the course of the season, Desrosiers built the Generals into a dangerous hockey team, leading the team to it's best regular season in years. The team finished 41-30-9-2, good enough for third place in the IHL, 19 points behind first place Fort Wayne. Bernie Gallant (50 goals), Jeff Pyle (44), Steve Stockman (43) and Peter Horachek (34) led the way on offense, as the team scored 375 goals. Rick Knickle was in net for 60 games, spelled by Rick Wilson for 23. The Generals went into the Turner Cup Playoffs on a hot streak. After earning a first round bye, they swept aside Milwaukee in four straight to earn their first ever trip to the Finals. They faced the two-time defending champion Toledo Goaldiggers, who finished just two points back in fourth place. Flint broomed Toledo in four straight to finally bring home the city's first ever pro hockey championship. Pretty simple look for this program. 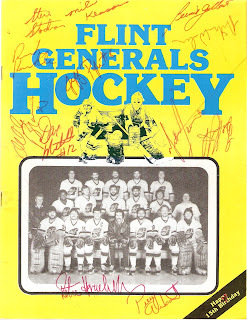 A yellow background with the team photo below the words "Flint Generals Hockey". This program is from Game 3 of the Turner Cup Finals, which the Generals won 5-3. And yes, it's autographed! Note the jerseys the Gens wore that year. Very similar striping patterns to the New York Islanders...thankfully they weren't canary yellow. 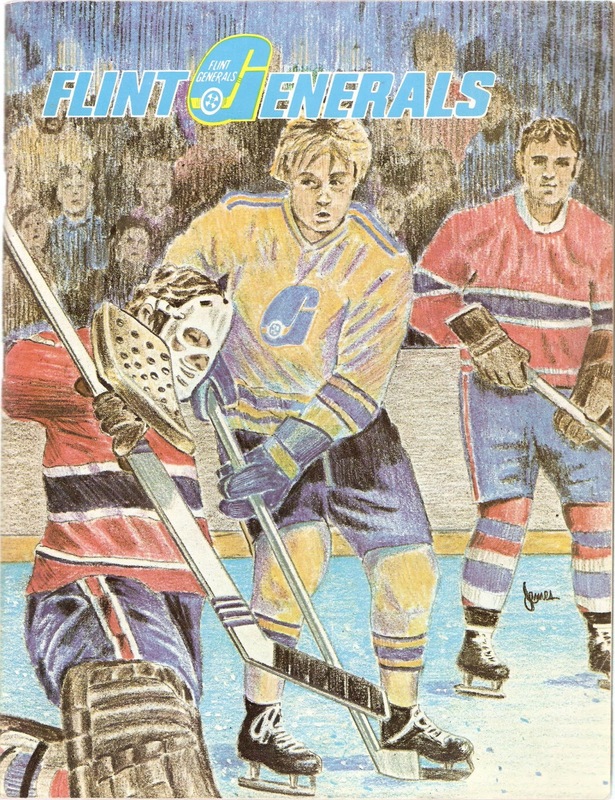 The Generals would play one more season in Flint before moving to Saginaw for the 1985-86 season.